Given the fundamental differences in the amount of d-amino acids likely to be seen by animals that have a large pregastric fermentation capacity, and hence, a relatively greater production of bacterially derived d-amino acids, it is reasonable to suggest that the intestinal epithelia of ruminants may possess a larger capacity to absorb d-amino acids than postgastric fermenters. In this regard, several amino acid transport systems and proteins capable of d-amino acid absorption have been identified. Of particular importance is those systems capable of absorbing d-amino acids which are especially abundant in bacterial cell walls (d-glutamate, d-alanine and d-serine). 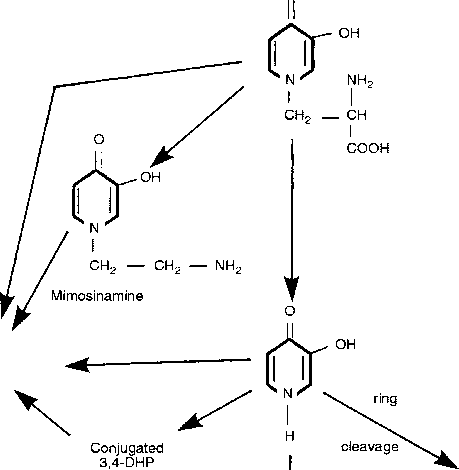 Biochemically characterized system x c activity has been defined as the Na+-independent obligate exchange of l-glutamate and l-cys-teine, which may be inhibited by d-glutamate (Dantzig et al., 1978). Recently a cRNA has been generated (xCT) that apparently encodes for system x c—like activity, when co-expressed with 4F2hc (Sato et al., 1999). However, expression of x c activity by enterocytes is unknown to these authors and investigation of the ability of xCT to recognize and transport D-glutamate was not reported. 2000). The differential expression of ASCT2 and Asc-1 activity on both membranes of enterocytes indicates the capacity to absorb significant amounts of bacterial-derived D-amino acids from the intestinal lumen into the blood. These understandings, and that the flux of specific amino acids into the blood depends on their ability to compete for transport, suggest that the indiscriminant use of D-, L-isomer combinations as a supplemental source for one lamino acid may perturb the flux of others into blood. 2001) transporters serve as recognition molecules for various retroviruses and, in terms of ion fluxes, that system X AG (EAAT5; Fairman et ai, 1995) and N (SN1, Chaudhry et ai, 1999) 'amino acid' transporters may be more accurately considered to function as amino acid-gated ion channels. Respectively, these understandings suggest that the ability to transport amino acids is associated with a health 'risk/cost' and indicate that amino acids can serve as 'signalling' molecules.